Fine mineral, metal, soot, smoke, and dust particles suspended in the air can harm our lungs. 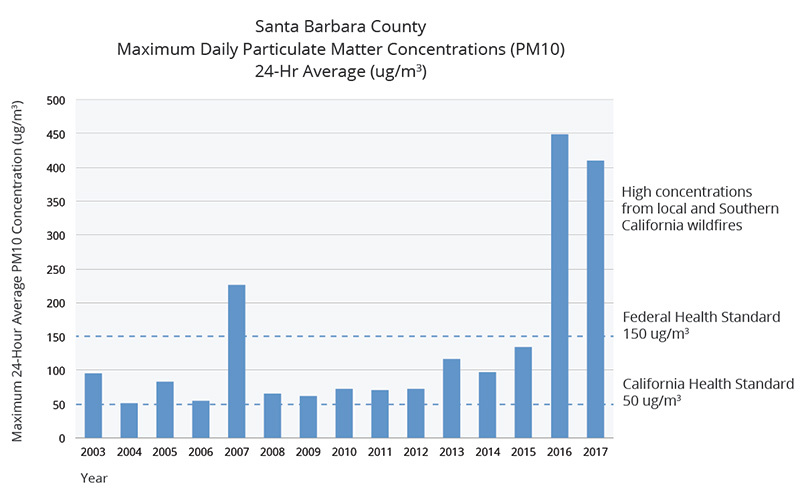 High PM10 concentration often occur during wildfires or windy conditions and can also be associated with construction, demolition, and agricultural sites. See also About Smoke and Health and Dust Control. For health reasons, we are most concerned with inhalable particulate matter less than 10 microns in diameter (PM10), and less than 2.5 microns in diameter (PM2.5). Particles of these sizes can permanently lodge in the deepest and most sensitive areas of the lung, and can aggravate many respiratory illnesses including asthma, bronchitis, and emphysema. High levels of particulate pollution have also been associated with a higher incidence of heart problems, including heart attacks. The figures below show the maximum recorded concentration of PM10 in the County since 2003 and the relative size of PM10 and PM2.5 compared to beach sand and a human hair.